First. 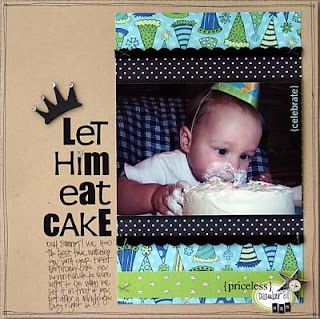 Let's announce the winner of the Paperie Collection prize pack from Making Memories! I am a hoarder, too, for fear that I will not be able to find them again. My faves are of course, Thickers, and Doodlebug designs for fun kiddie layouts. I don't use letters for journaling. I guess I just thought they would be so hard to use, but you have inspired me to give it a try. Thanks! Seems that many of us are perplexed on how to store all of our different alpha stickers with their different shapes and sizes. How do I store them? Time for honesty here, folks. I have an Expedit bookcase from Ikea; one 'square' 13x13x13 drawer is filled with alpha stickers. FILLED. They're just thrown in willy-nilly - no rhyme or reason. But hey, at least I know where they all are! As you can see, there really is no right or wrong way to store your stickers, just different ways. The main thing is to have them stored in a way that you know what you have and actually use them! It's midnight. Your creative juices are flowing. You're in the middle of a project and WHAM! "What do you mean I just used my last 'e'? That can't be right". You frantically start tearing through your scrap supplies looking for that missing 'e'. Murphy's Law - you have all of the z's you could ever need, but when you need that last 'e' - or other letter - you're out of luck. Seems to happen most of the time with vowels, right? Some companies, like Scenic Route, have made an effort to include many, many, many of the most commonly used letters in a package of alpha stickers. After doing a quick check of my stash (yep, have those too! ), I discovered that their alpha stickers have between 6 and 13 lower case e's! But still, eventually you will run out, it's just a matter of time. Mix it up! Many of us buy black alpha stickers because they're so versatile. Need another 't'? No worries! Look through your other letter stickers and mix fonts. Sometimes I even mix upper and lower case letters - it saves you from pulling your hair out when you're missing a letter, and it adds a whimsical look as well. Make your own. Depending on the letter, this can be easier said than done; however, in a bind it works. Hey, desperate times call for desperate measures! If you run out of an 'n', cut the top off of an 'h'. Need another 'a'? Depending on the font, you may be able to cut the top off of a 'd' or the tail off of a 'g'. The proverbial missing 'e'? No problem. 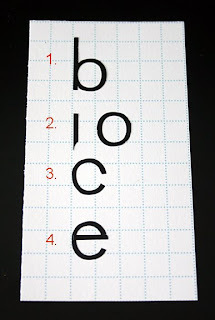 In this visual, I started with a 'b', cut the 'leg' off, cut it again to look like a 'c', then added the part of the 'leg' to make an 'e'. Easy peezy! Lots of possibilities, you just have to take a 2nd look at your letters and see what might work. The leftovers. Don't throw out those extra stickers when you're done! Many sticker sheets have both letters and numbers. For some reason, I don't seem to use the numbers very often. Here's a fun, easy way to create a scalloped border - take an '8' and cut it right down the center. Voila! Your own custom scallops! 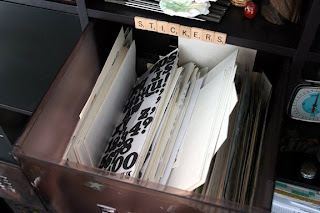 To read Layle's article on her favorite alphabet stickers click here. Love the drawer in the expedit idea. I have several drawers of other supplies (bling, ribbon) that are just tossed in so why I didn't think to make an alpha sticker drawer I just can't imagine. I will have one by the end of the day, though! LOL! Great article! I adore my letter stickers. And I am always running out of e's. Haha thank you for sharing your ideas! The article made me have a good laugh. :) That scalloped border is such a clever idea- I'm going to have to try that! 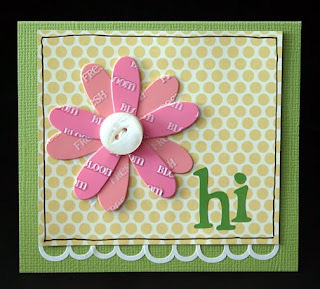 Neat-- love those tips on making letters and even scallops! Thanks, Layle. I love the idea about using numbers to create borders such as a scallop. thanks for sharing! I use the mixing up technique a lot. I like it so much, I do it even when I have plenty of the required letters. Love the idea of 8's cut in half for a scalloped edge. 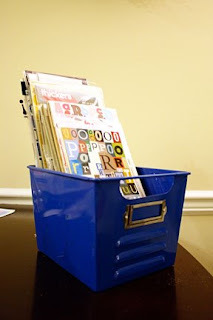 i love the idea of making letters you need out of ones you already have, awesome! Ooooh.. That scallop idea rocks!! Wonderful article and excellent ideas. I have my alphas sorted by color in a large photo storage box, soon to be two boxes! Yes, I too am an alphaholic! thanks so much for the article and the ideas.. i am loving this site... you have given me many ideas that i can use!!!! can't wait to see what is next!!! Thanks for all the ideas for "in a jam" alphabet ideas - I do some of these already, but a few of them are completely new to me - that sort of thing that makes me say, "Why didn't I think of that?" layle, you and i were on the SAME wavelength last week. check out the SC blog for tuesday the 11th, i did some projects getting rid of stickers, well felt letters actually. it's fun to read what you did as well! hope things are going well! I need to make a trip to Ikea soon! Thanks for sharing all the ideas. I currently have my alpas on a large binder ring. That idea for the scallops on the card just perked my head right up! I tend to use lots of my letter stickers up by cutting the tops from ds or qs (for 'a's), and the like, but I have never made Bs! And the scalloped edge with the 8s is wonderful! I use a lot of my numbers up on cards - who says you can't have a 27 or a 34 or a 41 on a card? !